The copy below is from a campaign done by Artisan’s Center of Virginia where I was their featured artist to tell, not just my story, but to tell the story of the artists in Virginia and the importance of our work on the Commonwealth of Virginia. 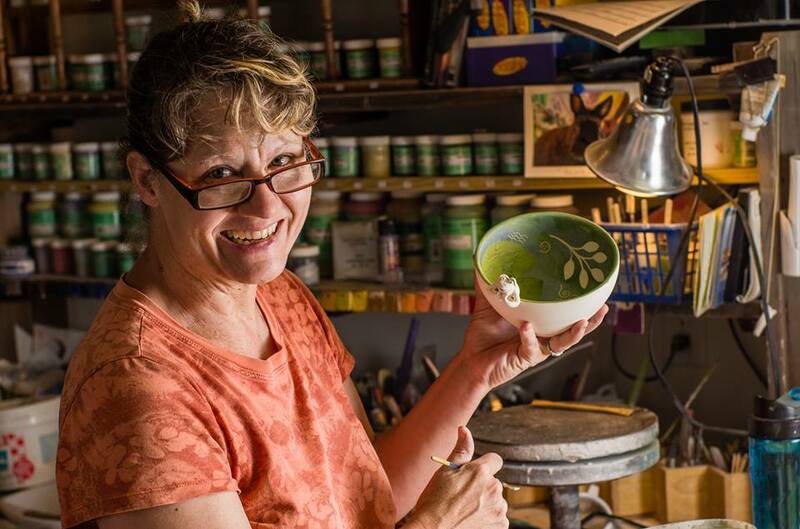 The first dot in Susie Wilburn’s artisan journey was in college where she was introduced to the potter’s wheel as an apprentice in the school’s ceramics program. She spent two years mixing clay and perfecting her ceramic production skills. While she loved what she was doing, the demands were heavy on top of a busy class load, so she decided to drop the apprenticeship in order to complete her degree. After graduation, she began a 25 year career journey in the printing industry, all the while feeling a nagging regret about leaving the ceramics program. She longed to get her hands back into the clay. Three decades later, in 2010 she was given a used potter’s wheel as a gift, and the dream of returning to the craft she had missed for so long, became a closer reality. Her throwing skills quickly returned and the artisan passion she had in college was reignited. The following year, when she was laid off from her print job, so she decided to embark on a new path and become an entrepreneurial potter….start a business. Not long after making this decision, Susie was introduced to the Artisans Center of Virginia during an Artisan Trail development meeting in her county. The dots began to connect. She went home excited, feeling she had found her “peeps” and she joined and became committed to helping to bring her community’s artisan trail to life. Additionally inspired by a fellow artisan who had just become an ACV Juried Artisan, Susie challenged herself to do the same. Influenced by her graphic skills and the natural world around her, she invented a new and playful style with her clay forms. She applied to the ACV Jury that following September and was accepted. An ACV Juried Artisan and on the O Shenandoah Artisan Trail, Susie is growing her business and developing her clientele. Her work is ever‐evolving. She takes advantage of all of the tools and assistance the Artisans Center of Virginia provides throughout her community and beyond. The dots of her artisan journey conntinue to connect as her career as a successfully emerges on the page. All across the Commonwealth there are many similar stories of how the Artisan Center of Virginia is connecting the dots to improve economic outcomes for Virginia artisans and their communities while assisting them in promoting their local artisan culture. Please connect with us and know that through your kindness today you will be making goals like Susie’s come true for others.